Julienne Peppers and Onions, slice Mushrooms, mince Garlic. Tenderize Chicken Breast. Season Flour with Salt & Pepper. Heat pan with Cooking Oil. Dust Chicken Breast with seasoned Flour on both sides, place in hot pan. Let golden brown, then flip Chicken. Add Julienned Onion and Garlic first, let cook for 2-3 minutes, add Peppers and Mushrooms, saute for additional 2 minutes. 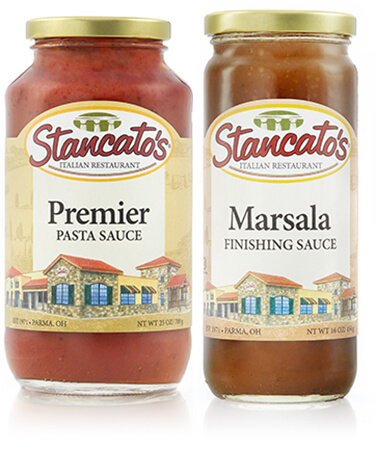 Add Stancato’s Marsala Sauce, then Stancato’s Premier Sauce. Stir together, then let simmer for at least 5 minutes on low heat. Place Risotto or other side dish on plate, top with 2 Chicken Breasts, then top with sauce and simmered Vegetables. Garnish with fresh grated Romano to your liking. Prep Onions and Garlic. Place cooking oil in warm pan. Add diced Onions and Garlic, cook slowly until Onions are translucent and strong smell of roasted Garlic. Add Arborio Rice to pan, stir the rice, coating all the rice with Oil still on low heat. If desired, then add White Wine. If no Wine being used, or after Wine, add 1 cup of Chicken Stock, increase heat to medium. Stir constantly using a wooden spoon or rubber spatula. As Rice absorbs the stock, then add 1 more cup of stock, continue stirring until that stock is absorbed, and continue with last cup of stock. Once most of the stock is absorbed, only slightly wet rice stir in Butter and Parmesan, rice will tighten up with Cheese, then add Salt & Pepper. Rice is ready to serve as a side dish. NOTE: You can add other flavors to your Risotto also, such as Fresh Herbs, different Cheeses or many substitute Vegetable Stock and Olive Oil for vegans.